Technology has transformed the way we communicate. Email, SMS, Twitter, Facebook, Flickr, MySpace, and other forms of communications have allowed people who would not have “met” ten years ago to develop social relationships. We get many great emails from people every day thanking us for what we do. Those emails put huge smiles on the faces of our entire team. We feel good when we learn that in some small way, we’ve helped another person. Yesterday, we received a postcard and a handwritten note from a creative who works on crowdSPRING – Audree Rowe. It’s a wonderful note and a great postcard. We posted it on our refrigerator door. 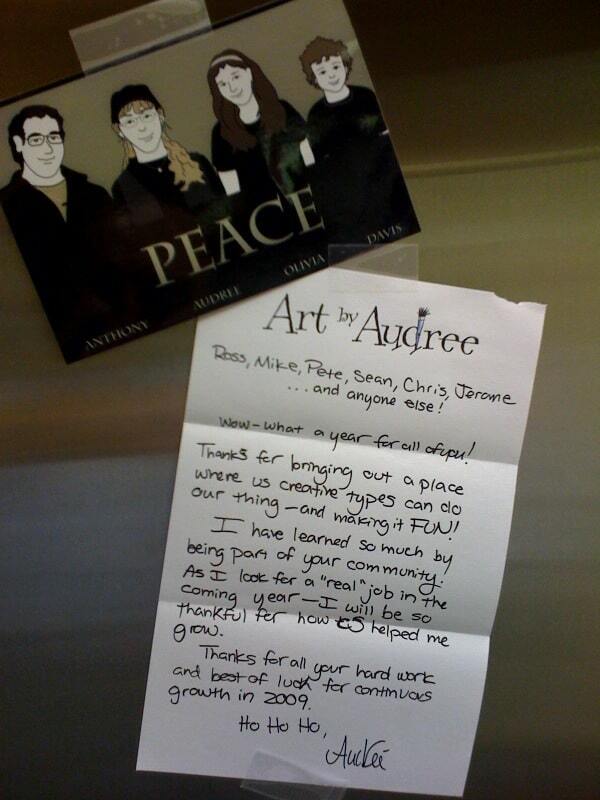 Our team was really moved that Audree took a few minutes to send us her kind note. It’s pretty amazing that a little handwritten note can be so powerful. We are very fortunate at crowdSPRING. We love our community.